I’m not going to be grumpy about being a vegetarian dragged to a smokehouse. I knew what I was getting into, and I was going to have dinner with important friends. Not eat. So I sucked it up and met them at 4 Rivers on Archer Road. Okay, a little grumpy. My only real option was a dinner plate meal where you choose 5 sides and a biscuit for one price. Almost all of their vegetable dishes had a meat ingredient. Usually pork. 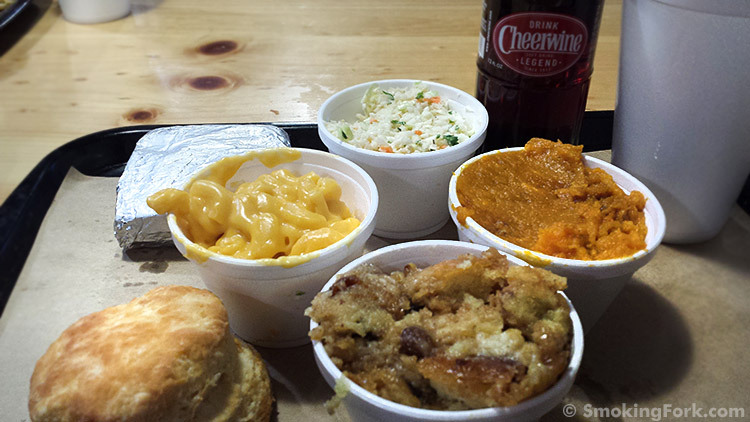 It was a stretch to find five: sweet potatoes, cole slaw, mac & cheese, baked grits, and bread pudding. Lots of starch. I splashed out and got a Cheerwine since I hadn’t ever had one before. My grumpiness is that this place has a lot of carnivore friends super excited, and the restaurant itself is kind of elegant-country-industrial. But you walk in, grab a plastic tray (a la Taco Bell), get served your meat right on the paper liner (if that’s your thing), and your sides and drink all come in styrofoam cups except for the foil-wrapped items. Okay… screech… Styrofoam? Yes, a huge pet peeve for all of the waste left for thousands of years. But wait. From what I hear in the industry circle is that it’s the new green Styrofoam that breaks down into powder in 2 years. So, not as grumpy as I was initially. But seriously, for the location, price, awards, and general smoked-meat-hardons that this place boasts, it just seems so trashy to be served on disposable everything on plastic trays. As for being a vegetarian in a strange land, I seriously hurt after this meal from all of the starch. The biscuit was dry. The sweet potato casserole was overly sweet. The cole slaw lacked seasonings but felt fresh-ish. The bread pudding was okay. I liked the mac & cheese because it felt like diner mac & cheese. And the baked grits was wrapped in foil and had a weird skin on top and a burnt layer at the bottom but tasted okay. So basically they totally won at the thing I really hate with a lot of restaurants…they really shoot to please as many people as possible, and hold back seasoning so as not to scare anyone. One redeeming quality was the separate dessert counter that would have been a lot of fun if I hadn’t just O.D.ed on starchy sides. I wanted some real flavor and I’m sure the sugary selections were better than the stuff in the styrofoam cups on my plastic tray. But really, the restaurant industry is stuck with the reputation of using a super high volume of water. Yet solutions are few. Using proper dishes means washing them in a way that satisfies the health department. But using disposable serving materials means lots of trash and waste.